A great choice for industrial and domestic use. 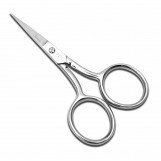 The handles Large Rings allow you to get in and out of the scissors quickly and easily. Famore Fine Point Scissors have many uses: These scissors are great for snipping threads while sewing, quilting & embroidery work, and keeping with your knit and crochet projects. Perfect for trimming – trimming loose sewing, quilting, and embroidery threads - also dog-ears and lose fabric. Small Size – (4-in) design allows for navigating closely around the embroidery hoop or sewing machine to single out wanted threads.